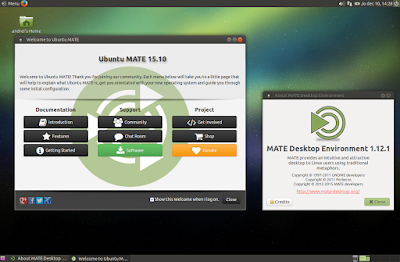 The Ubuntu 15.10 and 16.04 MATE PPAs were updated recently with the latest MATE 1.12.1. According to Martin Wimpress, Project Lead for Ubuntu MATE, the PPAs use the same source packages that he's done for Debian, which are currently being reviewed by the FTP masters and should land in Debian Unstable in a couple of weeks, so they should be safe to use. Among the changes in MATE 1.12 (released about a month ago) are various fixes (for example: panel applets are no longer reordered when changing screen resolutions) and improvements for GTK3, including GTK 3.18 support, better touchpad and multi-monitor support and more. Check out THIS article for a complete MATE 1.12 changelog. I couldn't find a changelog for MATE 1.12.1.
you you shouldn't need the Ubuntu Xenial PPA for long because as soon as the MATE 1.12 packages are accepted into Debian Unstable, they should be automatically imported into Ubuntu 16.04.
the small MATE Dock applet I wrote about a while back was added to Debian Git recently by Martin Wimpress, and until Ubuntu and Debian reinstate the gir1.2-wnck-1.0 package (which was dropped a while back and is required by this applet), you can install this applet by using the Wily/Xenial Ubuntu MATE PPAs. The first command installs PPA purge and the second command purges the PPA (disables the PPA and downgrades all the packages installed from that PPA).